The Chinese smartphone manufacturer, Elephone, is aiming to be available in the market with many different smartphone models. The competition in the smart phone industry has started to rise again. In particular, the Chinese smartphone manufacturers entering the market with serious price decreases in prices, Samsung is the most obvious example of how competitive. The Elephone wants to revive the big-screen smartphone models on the market. We can notice that their company has released four models in the A6 series, the other three are previously introduced: A6, A6 Pro, A6 Mini. We received a lot of striking information on Elephone’s new smartphones, which are expected to be screened at a global event in Hong Kong next week. The smartphone that Elephone calls the A6 Max comes with a 6.5-inch display of the same size as the iPhone Xs Max. In addition to the large screen, the frame is fine and captures an elegant appearance. In the performance part, ELEPHONE didn’t leave much to be desired in its intermediary, since it applied the Helio P35 processor in the handset, providing superior performance to smartphones that have the Snapdragon 625 platform. To complete this part of power, the 6 GB of RAM and 64 GB of storage guarantee a good overall usability, something that will please the users of the brand. Besides, it is already out of the factory with Android 9.0 Pie, which is the latest version of Google’s operating system. 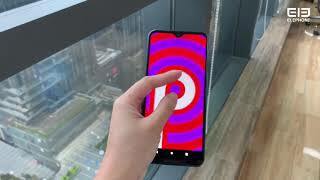 With its being visually similar to the competitor’s Umidigi Power and other devices, Elephone A6 Max brings the circular-format fingerprint reader and the vertically aligned 16MP and 5MP dual cameras at the back. On the right side it features the power and volume control buttons. Already in the front, the display FHD+ 6.53 inches comes with the notch in drop to house the camera selfies 16 MP, giving plenty of room for the total use of 92.7% of the screen LTPS, which has ratio 19.5:9. The rear of the Elephone A6 Max has two cameras, one LED flash and a fingerprint scanner, while the rear design with color change and mirror effect seems to be overwhelmed by users. Although more information on the device has not been published, the eyes are now translated into an event in Hong Kong from April 18 to April 21.